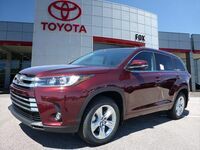 For 2019, the Toyota Highlander has largely been carried over meaning shoppers will see the same five trim levels and most of the same standard and available features that were available in the outgoing 2018 Highlander model. The price, however, has risen slightly with base LE models available with a starting MSRP of $31,330. Thanks to small updates each model year, the 2019 Toyota Highlander remains competitive with other three-row SUV models and should have plenty of the amenities that drivers are interested in including an available rear-seat entertainment system, an available power liftgate, and USB ports scattered throughout the three rows. Find pricing and feature information for all five of the 2019 Highlander’s trims below. Then, head to the Fox Toyota inventory pages to browse in stock models using the link below. Key Features: Toyota Safety Sense, split-folding rear seats, USB ports, a rearview camera, Bluetooth compatibility, and more. Key Features: Power liftgate, automatic climate control, extra USB ports, leather-wrapped interior accessories, SofTex upholstery, and more. Key Features: Leather seats, a multi-information display, a moonroof, keyless entry with push button start, and more. Key Features: Upgraded wheels and suspension, automatic headlights, Entune premium audio with Toyota navigation, and more. Key Features: Heated seats, second-row captain’s chairs, Toyota Entune Premium Audio, blind spot monitoring with rear cross-traffic alert, and more. 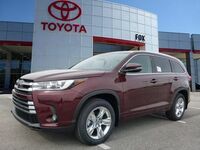 For a more in-depth look at what the 2019 Toyota Highlander lineup has to offer, visit the Fox Toyota dealership in Clinton to connect with one of our team members and schedule a test drive. Online scheduling is also available via the pop-up form below.